Explore all the most beautiful museums in Paris and the surrounding area with one unique access! The more you visit, the more you save! The savings you can achieve is probably one of the greatest advantages of the Paris Museum Pass, but you should also think about the convenience of making just one booking and having the freedom to be able to choose when to visit and how many museums you want to see. This provides unlimited access to more than 50 Paris museums and attractions on consecutive days. What more could you ask for? Maybe the chance to Skip the Queue? The "Skip the Queue" option is included for entry to all the museums! On the day of your visit, you simply need to show your pass at the entrance and you will avoid all the queues at the ticket desks. The key word in relation to the Paris Museum Pass is "freedom" as you are not bound by pre-arranged time slots and are able to save both time and money. Choose which museums you want to visit according to your preferences. After having purchased your Pass on-line, you will just have to collect it at the bureau located a few steps from the Louvre Pyramid. From the time of collection, the pass will be valid for two consecutive days. 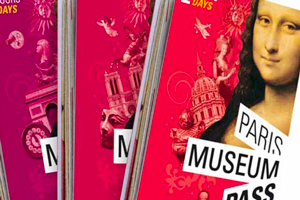 Together with the Pass, you will be provided with an illustrative booklet which will provide you with all the opening times and information about the museums inside. Thanks to this, it will be much easier to get to the museums you want to see and you will be able to choose the time at which you wish to visit. In addition to this, with your Museum Pass in your hand, you won't have to join any of the queues and will be able to pass right in front of the sometimes lengthy queues at the ticket counters. This is an easy way to ensure that you are able to visit everything you wish to see and will also provide you with an original memento of your visit showing the stamps of all the attractions you have been to..
Attractions near Paris: the Château de Vincennes, the Château de Rambouillet, thePalace of Versaillesand the Trianons and the Château ofFontainebleau.